So I totally had another post planned today venting about something that upset me (read: has made me cry a lot lately) but I decided to give it one last ditch effort to find a solution. 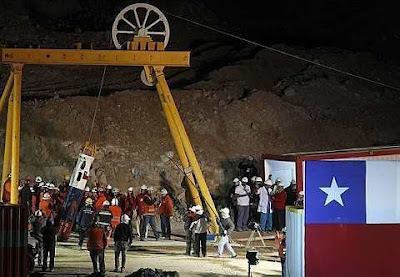 And instead talk about how stinkin' AMAZING the Chilean mine rescues were last night. I stayed up waaaay past my bedtime watching several rescues on CNN. Crying like the baby I am. (In case you have not sensed it by now, I cry a lot. For good things and happy things and frustrating things and sad things. That's my release.) I have been entirely too invested in this story and just think it's such a miracle that they are all safe! News stories are all so gloom and doom or politically nasty or Hollywood skanky. It has been so refreshing to follow such a hopeful story with such a triumphant ending. 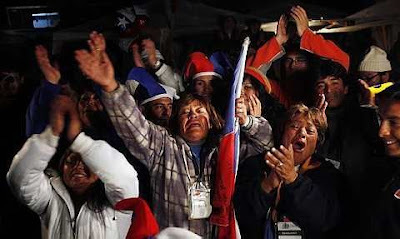 I know nothing about the Chilean government. Nothing. But I was so impressed with their President. Regardless of politics, I think we have always had American Presidents who truly care about their country. Who would chose to do that job otherwise?! But I cannot imagine any of our Presidents hugging and kissing and crying for the rescued workers as their President did last night. Maybe Bill Clinton now. But not then. I think that is greatly due to the culture difference. We just don't kiss and cry like that in America. I thought it was so touching to see how sincerely invested he was in each of those miners. Did y'all see that their families literally moved to the mine entrance. There was nothing there. But they built camp sites that included a red corrugated metal school house too. The entire story has moved me for months. The miners are amazing but so are their families who moved their lives to hold vigil. No on to a totally different topic. My new favorite Sunday night show. 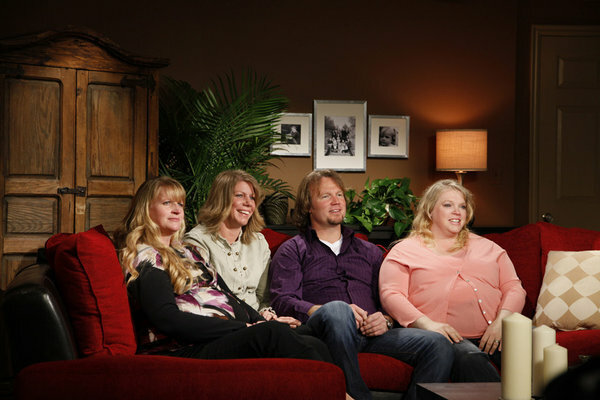 Sister Wives on TLC. So I love all things extreme religion. Theology is one of my very favorite topics. Fascinating. I mean, polygamy is not for me. I can't understand it at all, actually. But who am I to judge? They clearly made this choice of sound mind and body. No prairie dresses or emotionless faces. They are regular people living their faith. I dig them. Don't want to join them, but they are so normal in so many ways. I knew families like this existed. Meaning, I knew that not all polygamists wore prairie dresses. But the husband is just a regular guy. Not controlling and demeaning. They laugh and fight and act silly and play and do yard work and burn toast just like every other household. Is anyone else watching this show? Do you find it as interesting as I do? I've been watching Sister Wives and and trying to get more into it. It's kind of the same as Real Housewives of DC for me. I want to want to like it, but there is a little spark missing. I guess the unreality version of polygamy, Big Love, has a little edge on Sister Wives for me at least. Now, that show I LOVE! 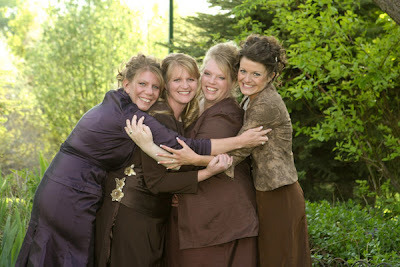 I watch Sister Wives, but I think they ALL have a screw loose. Especially the husband. He seems off. i enjoy Sister Wives. i respect the lifestyle choice, but i would have issues sharing my husband with multiple women and raising all their kids. but it would be nice to have extra sets of hands to help around the house and such. take care. I have not seen Sister Wives, but I did start watching Big Love on DVD. I find it really fascinating to watch the dynamic between the husband and the three wives. Not sure how realistic it is, but the plotlines and character development are excellent! I was glued to the internet once the miners began their ascent and I don't think anyone has put into words just how and why this was so incredible as you have. It was beyond miraculous that every single one survived. Faith is so strong a thing and a wonder to behold. Unfortunately we don't get Sister Wives in Tokyo. I'm pretty sure that would not be allowed on the airwaves-even via our Apple TV. I have been following the Chilean Miners story. I'm so thrilled they are all out, safe and with their families again. I'm so happy that it didn't end the way I thought it would end. Sorry...I'm pessimistic. I'm going to show my ignorance here, but is mining really necessary? Too many sick accidents happening with miners ya know? Now about the polygamy group. Odd....I couldn't share my husband with another woman at all, ever, no way no how. I come from a religion where polygamy was once practiced and I'm happy to say that I wasn't alive during that time period because I don't think I could have accepted that. However, it was never the way the media or people think it was. Topic for another conversation. I have not seen Sister Wives but it sounds very interesting! A friend was telling me about it. 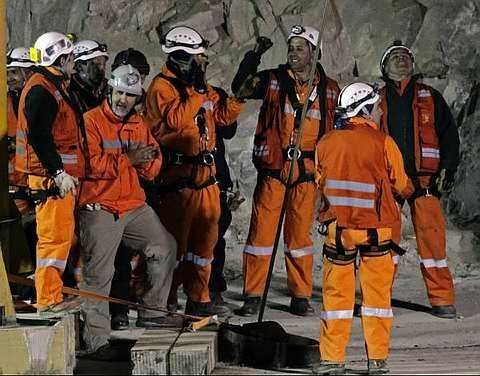 So thrilled that the miners were all rescued! I have watched Sister Wives. I don't get it but I keep watching.